Transform your apple watch into a charm necklace. This Bucardo accessory fits into the band slots of the apple watch, simply slide your wrist bands out and slide your Bucardo accessory in. Enjoy and wear your apple watch in a different way. Constructed of the highest grade stainless steel, each accessory is stamped with Bucardo's signature hallmarks. 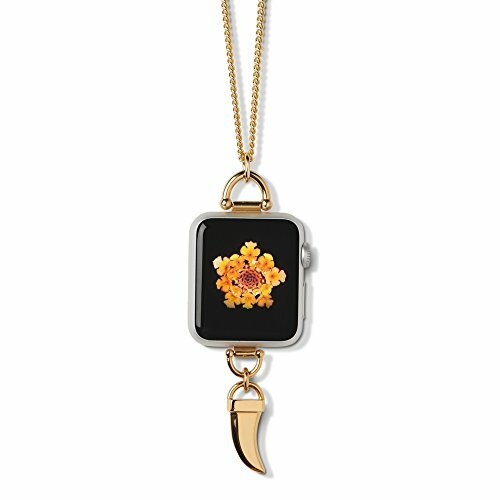 Once you have purchased a complete necklace, you may customize your look with our additional interchangeable charms, sold separately. ATTENTION TO DETAIL: Thoughtfully designed charm is constructed of high grade stainless steel. The back of the Apple Watch remains exposed to facilitate easy charging. Bucardo's signature hallmark stamps ensure authenticity. Interchangeable charms are sold separately. Designed to fit both Series 1 and Series 2 Apple Watch. CHIC MEETS MODERN: Free your wrists and make a statement. Wear the Bucardo charm necklace accessory on special occasions, date night, or for everyday alternative wear. Add some style to your modern day tech. STAY CONNECTED: Continue to count steps, receive emails, texts, notifications, phone calls, and most functions. Heart rate monitor and Apple Pay do not function when the Apple Watch is worn off the wrist. EASY TO USE: Slide out straps, and slide Bucardo accessory in. Comes complete with charm and 38" adjustable chain. Item arrives beautifully packaged in a giftable box. The Apple Watch is not included. OUR GUARANTEE: We stand by the quality and craftsmanship of every Bucardo accessory. We pride ourselves on excellent customer service and offer a 30-day return or exchange if you're not completely satisfied. If you have any questions about this product by Bucardo, contact us by completing and submitting the form below. If you are looking for a specif part number, please include it with your message.